Diseases from unsafe water and lack of basic sanitation kill more people every year than all forms of violence, including war. Children are especially vulnerable, as their bodies aren't strong enough to fight diarrhea, dysentery and other illnesses. 90% of the 30,000 deaths that occur every week from unsafe water and unhygienic living conditions are in children under five years old. The WHO reports that over 3.6% of the global disease burden can be prevented simply by improving water supply, sanitation, and hygiene. 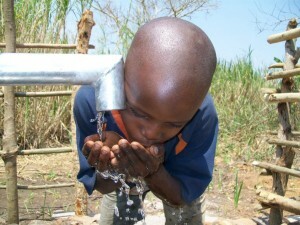 In Africa alone, people spend 40 billion hours every year walking for water. Women and children usually bear the burden of water collection, walking miles to the nearest source, which is unprotected and likely contaminated. Time spent walking and resulting diseases keep them from school, work and taking care of their families. Along their long walk, they're subjected to a greater risk of harassment and sexual assault. With safe water nearby, women are free to pursue new opportunities and improve their families’ lives. 12/23/13 Shane Blue $115.00 This is the good fight. 12/23/13 Shannon Sigmon $115.00 So important, love this! 12/23/13 Steve Nichols $115.00 great project Dre!